After graduating from her 5 year Osteopathy degree, Dr Lizzy Archer (Osteopath) consolidated and furthered her studies in rehabilitation completing a 2 year comprehensive rehabilitation course with world renowned, Polestar Pilates. Since graduating from university, she has been treating patients using ‘hands on’ skills, in conjunction with pilates teaching, using both modalities of treatment to move people towards better health. Lizzy is a strong believer in educating the patient in regards to their condition, treatment, management and prognosis. She believes this creates a sense of empowerment for the patient so that when they leave the clinic they know exactly what they have to do to progress themselves towards better health. In a treatment with Lizzy you can expect a lot of questions in order for her to better understand your history, firm hands on treatment and, exercises and/or advice to assist in the management of your case (not to mention some good conversation and laughs!). Lizzy has a keen interest in the treatment and management of postural complaints and, lumbo-pelvic pain. 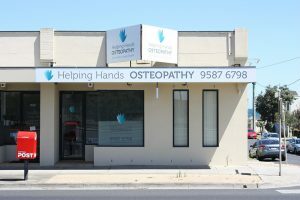 If you’d like to make an appointment to see Dr Lizzy Archer at Helping Hands Osteopathy, call (03) 9587 6798 or Book online via our website or the Helping Hands Osteopathy Facebook page.